DERIVED from the traditional tops worn by Rajasthani and Gujarati women, cholis are no more than blouses held together by drawstrings at the back. These could range from ones with the string criss-crossing down the back (like a shoelace) to versions with just two strings — one at the bottom (tied just above the waist) and the other fastened around the neck. In between are a variety of cholis, which are daringly close to bras and some with high necks. All these numbers are traditionally combined with ghagras or sarees, with or without a dupatta, shawl, odhni or stole. "The choli is the most sensuous of all garments created for women," gushes Bobby Malik, an exporter-turned-designer. "It not only flatters the feminine form, but also brings out the romanticism in a woman. But where Indian designers have failed is at giving it an international look and making it still more beautiful." On his part, Malik has tried to "dynamise the choli concept" by breaking out of the convention of teaming it with just conventional ghagras and sarees. He has cholis to go separately with sarongs, harem pants, fitted long skirts and is now experimenting with low-waist trousers. Says Anupama Raj, a boutique owner: "There is a very real need to re-invent the choli so that it can be worn with a variety of outfits. Just as we see the choli to be a deconstructed form of the blouse, we need to deconstruct the choli. Only then, will it be acceptable internationally." Sonora Kabir, another Delhi-based designer, seems to have a way out: "Normally, the choli is supposed to hover around the navel area. But if you crop the lower edges and combine it with a funky design — beads, embroidery... whatever — it would be chic enough to be worn over jeans or a pair of trousers." 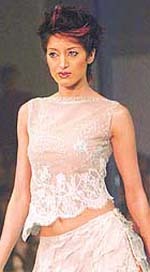 In 1998, Kabir recalls that she had come up with a collection in pale white, inspired by the Victorian dresses worn by Kate Winslet in the Titanic. Those were extravagant numbers with long georgette sleeves and layers and layers of exquisite embroidery. "It was an instant sellout," she narrates. "But later, I wanted to check if it was just the hype surrounding the movie that resulted in the sales. So I designed a range of plain full-length gowns with attached corsets. It worked. And now, I am working on a few strapless versions." Kabir’s latest collection includes a fuschia blue corset, which is a little on the naughty side with a skin-coloured georgette lining that makes it appear backless from a distance. In a similar cut and fit, she has another version with mirrors and conch shells as embellishments. In Raj’s store, the hottest number is a black choli with cap sleeves and hooks at the back which can be worn either with a saree like a conventional blouse or separately, with a lehnga or ghagra. Another popular design is a short blouse with tulle frills at the nape and a layer of black georgette over beige satin and short tulle frilled skirts to go with it. "Designing cholis and corsets, or for that matter, blouses and bras is not as simple as it seems," explains Malik. "The cutting and draping takes a day, but embroidery, depending upon the intricacy and design, may take several weeks. And yet, you may not get the perfect fit!" "I always wanted to design corsets, but every time I tried to conjure up one, I failed," confesses Kabir. "My aim was to design corsets not for the same purpose they were invented — as inner wear. They have to serve as outer wear at this time and age." Raj explains that the fundamental aspect of a woman’s upper garment is the cut: "Since the corset is wired with a flexible, plastic-like material (called the bone), it has the wonderful characteristic of retaining the shape of the bust. As a result, you don’t need to wear a bra."